As one of New York City’s most in-demand violinists, Kelly Hall-Tompkins delivers classical and popular music like you’ve never heard it before, Friday, May 19 at 8:00 p.m. at Diana Wortham Theatre in downtown Asheville. Known for taking chances on unfamiliar material as well as soaring through the classics, this musical virtuoso’s career spans solo, chamber and orchestral performances. For this Mainstage performance, she is joined by soloist and chamber musician Craig Ketter, a leading pianist of his generation. Ketter performs with power and a style that has garnered international renown since his first solo recital at the age of ten. Together, Ketter and Hall-Tompkins bring a whirlwind performance of classical and modern tastes by two leading musicians of their generation. 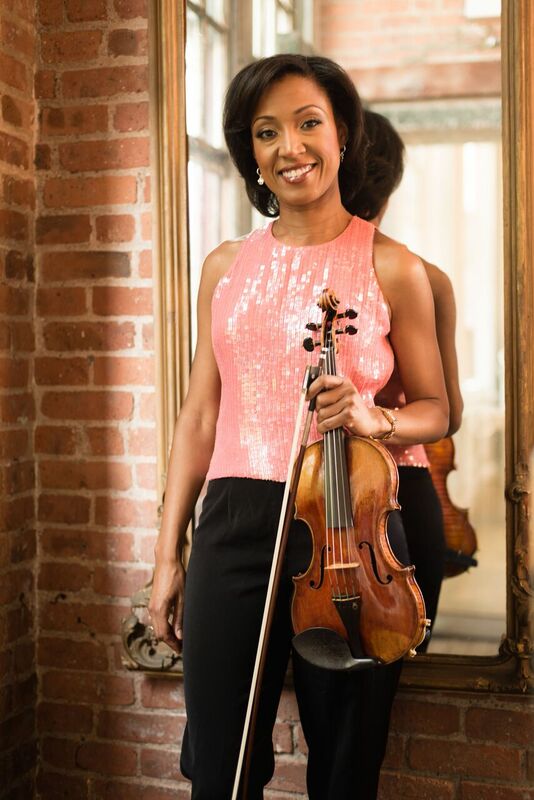 Winner of numerous classical music competitions, and currently the actual ‘Fiddler’ violin soloist for the Broadway production of Fiddler on the Roof, Hall-Tompkins has been a featured soloist in over 100 Broadway performances to date. Hall-Tompkins has many major television appearances and is a significant collaborating partner with acclaimed fiddler, Mark O’Connor. Hall-Tompkins’ distinguished orchestral career has included extensive touring in the United States including Carnegie Hall and Lincoln Center, and internationally including Japan, Singapore, and Scotland. For her Asheville performance, Hall-Tompkins will perform the following works: Piazzolla’s “History of the Tango”; John Williams’ theme from Shindler’s List; “Pure Imagination” from the movie, Willy Wonka and the Chocolate Factory; movements from Sonata in B flat by Joseph Bologne, Chevalier de Saint-George (the first classical composer of African ancestry); and Richard Strauss’s Sonata in E flat. Also a dedicated humanitarian, Hall-Tompkins founded and directs Music Kitchen-Food for the Soul, which has, to date, brought over 80 chamber music performances to homeless shelters from New York City to Los Angeles. Remarkably, she also speaks seven languages. Enhance Your Experience: A free lecture and demonstration with Kelly Hall-Tompkins will be held at Asheville Music School on Thursday, May 18 at 5:30 p.m. In her talk, "What Color is C#? ", Hall-Tompkins discusses her gift of synesthesia, the ability to perceive sound as color, and speaks about how this affects her as an artist. She will also talk about becoming a musician, practicing, and performing. Recommended for ages 10 and up. More information at www.dwtheatre.com/kelly-hall-tompkins. Kelly Hall-Tompkins’ Asheville performance is made possible by Performance Sponsor Parsec Financial; and by Mainstage Music Series Sponsors Joel & Deborah Bohan Berkowitz, Henry LaBrun, Dianne & David Worley, Omni Grove Park Inn, and Signarama; with additional support by Media Sponsors The Laurel of Asheville and WCQS 88.1 FM. The Diana Wortham Theatre is located at 18 Biltmore Avenue. Patrons enter the theatre through the breezeway between Marble Slab Creamery and White Duck Taco, and into a large interior courtyard with multiple glass doors leading to the theatre’s lower lobby and box office. The intimate theatre seats just over 500 and boasts exceptional acoustics and sightlines, making it the premier performance space in Western North Carolina. The Mainstage Series is supported by a grant from the North Carolina Arts Council, a state agency. The Mainstage Series 2016/2017 Season Sponsors are the Asheville Citizen-Times, Blue Moon Water, Creative Energy, 67 Biltmore Downtown Eatery & Catering, the North Carolina Arts Council, and the Renaissance Asheville Hotel. To obtain more information on the Mainstage Series or to purchase tickets for the May 19, 2017 performance of Kelly Hall-Tompkins at the Diana Wortham Theatre (Regular $32; Student $27; Child $20; Student Rush, day-of-the-show with valid I.D. $10), call the theatre’s box office at (828) 257-4530 or visit www.dwtheatre.com.